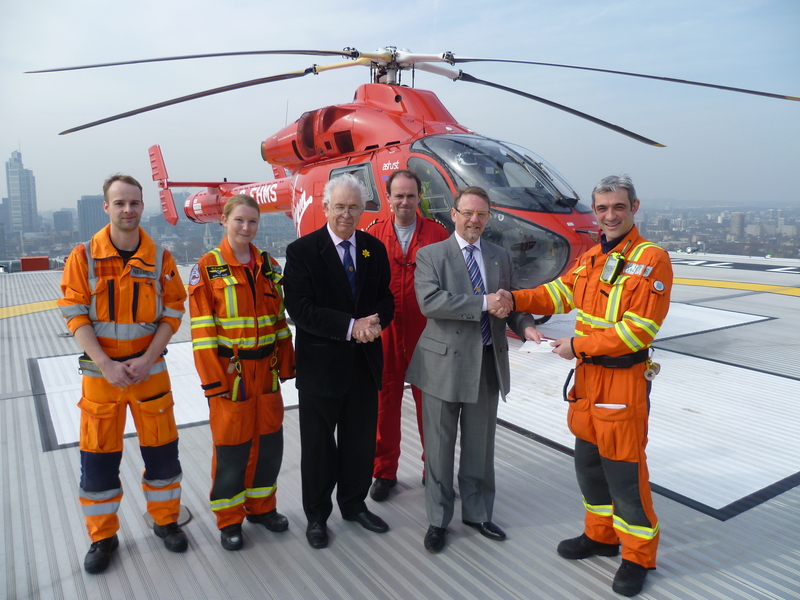 Bromley Rotary Club Presidents Iain Cowie (2011) and John Taylor (2012) visited the new home of the London Air Ambulance Charity to present a cheque for £2,500 recently. The helipad is on the roof of the newly rebuilt Royal London Hospital in Whitechapel Eighteen floors up, the view of the city is amazing and they had to hold the cheque very tightly as it can be quite breezy. Iain is presenting the cheque to the doctor while the pilot stands in the middle and two paramedics on the left. The funds were part of the proceeds from the annual Christmas sleigh collection so if you donated then your money is going to a fine cause. Other donations were made to fund the child-friendly artwork in the new Children’s A&E department in the PRU Hospital, taking disadvantaged children for a day out to Chessington and numerous other deserving local causes. In addition Rotary International has almost conquered Polio world-wide, having raised hundreds of millions towards this cause. The club has also funded a bore-hole In Africa to bring water to a village thus saving the residents a 5 mile round trip, just to get their daily water. If you would like to know how you can help such worthwhile causes and enjoy the fellowship of the Club while doing it, please visit our website www.bromleyrotaryclub.org.uk or call Iain on 01959 573678 and he will be pleased to help.